Incheon Metropolitan City is where the modern history of Korea ignited. Modern History Park in Jung District keeps the 130 years of traces of modern history of Korea since opening of the Incheon Port in 1883; it was the first of the three opened ports: Busan and Wonsan during the era. So the city rapidly shaped into a modern city more than any other cities in Korea. Despite the slowdown of this advancement for some period, Incheon Metropolitan City and Jung District gathered their strength one more time to bring back the former glory in all aspects from culture and art to history. 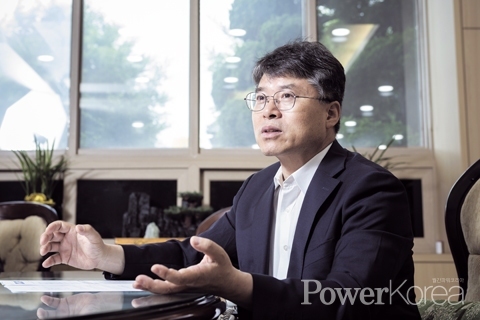 Under the slogan ‘Open Port City, Future City, People Centered City’, Jung District Mayor Hong In-sung declared his firm vision for fairness, communication, participation, safety and vibration. <Power Korea> met Hong and heard his story. Q. You declared a vision of the district January this year. A. I did. And I prepared it for 6 months. The vision is consisted of 5 goals and 12 implementation strategies. 5 goals are to create a historic and cultural city, a safe and inviting city, a vibrant economic city, a balanced city, and a resident-centered city. We will build a complex marine cultural belt that will connect Yeongjong Island to the inner harbor to the southern harbor; it will turn the district’s tourism resources to a profit generating business. We will proudly spread the fact that Jung District was one of the centers of independence movement. We will create unique cultural contents to attract more people to the city and to the district. Q. Tell us more about culture contents. A. We are working on events to celebrate the March 1 Movement and the 100th anniversary of establishing the Provisional Government of the Republic of Korea alongside creating Kim Gu Street that will illuminate the years of his youth working as a laborer of the harbor construction. Jung District is the place where the Korean national flag was used for the first time on the United States-Korea Treaty of 1882, and where the 13 provincial leaders’ meeting for establishing the Hansung Provisional Government took place. We will turn Dap-dong Cathedral and St. Michael’s Anglican Church as centers for this historic education and tourism while use the port area where busking and music performances are taken place on a regular basis. Q. You have increased education and welfare budget. A. It is USD 115 million, 34% of the whole budget of the district. The budget will be used to increase the number of senior citizen centers, to furnish massage chairs, to support health insurance, pension and medical expenses, to improve roads for disabled, to facilitate women programs alongside running manless delivery service for their safety, to give out $440 to families living with 3 generations on Korean Thanks Giving Day, to improve youth programs, to secure more daycare center, to install air purifiers in daycare centers, to build schools and repair worn out equipment, to provide free meals and uniforms, and to build youth training centers. Q. Tell us about urban regeneration you are working on. A. 10% of the district is the old city center and 90% is new towns. So we need to build infrastructure in new towns. For this, we will extend the Yeongjong Community Service Center, open a general hospital in Yeongjong International City alongside various other amenities such as youth centers and senior centers, roads and highways. As for the old city center, housing is one of the urgent issues. Instead of rebuilding, we are working on remodeling. Shinhung-dong and Dap-dong are designated for remodeling. Other projects include improvement of roads and creating a communal rental store building. Q. The thing you wish to have done during your term. A. It is the resident-participatory budget system. We allocated $263,968 budget for the system last year and will increase the volume to $1.319 million this year for creating King Cherry Blossom Street and for installing alley crossroads in Yulmok-dong. In order to gather residents’ opinions, we run a resident academy and a meeting is taken place in 12 dongs (towns) a month. Q. What tourist attractions do you boast? A. Jung District has 41 ‘first-happened’ titles in Korea. Freedom Park, for example, is the first westernized park in Korea and Gyeongin Line, for another example, is the first railway that connected Incheon Station to Noryangjin Station Seoul. A forest lodge is on the way to build on Muui Island alongside resorts and bicycle lanes. Q. Lastly, any comments you would like to make to residents? A. Jung District has won the local government competitive index in 2018 held by the Korea Institute for Public Autonomy for four years in a row. Also, we ranked No.1 at the energy saving implementation appraisal among districts in Incheon in 2018, and No.3 at the integrity appraisal held by the Anti-Corruption and Civil Rights Commission. Like I told you in our vision of the district, we value our residents and communication more than anything else in implementing the projects and I and my staff will do our utmost effort in creating a better and happier Jung District. Copyright © 2008 - 2019 월간파워코리아. All rights reserved.